ChildHope's Kindness Campaign 2015: Save, Spend, and Share! A few weeks ago during our lunch with Janice for the Mom Manifesto launch at Slice, we also got to know about Childhope Asia Philippines, MomShare's (Mommy Mundo's outreach arm) partner beneficiary for 2015. ChildHope is a non-stock, non-government, and non-profit organization working to help the welfare of Filipino street children. ChildHope provides them with basic social services, values education, and vocational skills among others. When I was younger, I've always thought what if I put a place and take in every street children I see, feed them, have a place for them to stay and take a bath. Wouldn't that be nice? It's really heartbreaking to see these street kids with no food to eat and sleeping on the side walk. It is nice to know that there are NGO such as ChildHope that we can work with to do different activities to benefit these kids like walk-a-thons or bowl-a-thons to raise funds for ChildHope. You can even celebrate your birthday with the them by having a feeding activity! Chips Guevara, board member of ChildHope, who shared with us the Kindness Campaign 2015. Now that Y's in her curious stage, she always ask why are there street children and why are they asking for money. Where are their parents? Where do they eat? Why do you have to give them food? It's overwhelming to answer all these questions a 4-year old asks and I always answer them the best way I could. I want my kids to learn to share, have compassion, respect and how to nurture kindness. The Kindness Campaign is just perfect for her, it's simple and is easily understood by young children like Y. You can do this at home! 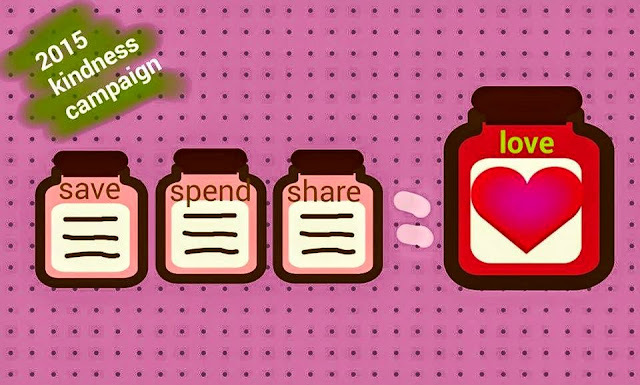 Gather three jars or cans and label each jar, SAVE, SPEND, and SHARE. Eversince I gave the cans to Y, she has been asking me, her papa, yaya and her grandparents for coins so she can put it inside her cans. Although she wants to save it all for her, we always remind her to share so the kids she sees on the street can have food, shelter and toys. And after filling the SHARE can, you can go to a ChildHope Sharing afternoon, where you can organize or join one of their feeding programs so your kids can experience and see for themselves who are they helping! I can't wait for our SHARE can to be filled up! If you are going to the Expo Mom, you can also bring your donations in cash and kind, this is in lieu of entrance fees! If you want to get in touch with ChildHope, you may reach them thru the ChildHope Asia Philippines Facebook Page or you can reach them at these numbers: +6325634647 / +6325617118.